US equities are effectively flat lining around sp'2058/60. Yellen is due to make an appearence at a Fed conf' in San Francisco. There remains threat of a price snap (more inclined to the upside) in the closing hour. Regardless of the exact close though, it has been a week for the bears.. with sig' net weeky declines for all indexes. A tricky close to call, and with the smaller 5/15/60min cycles as they are.. the bias will be to the upside.. even though we're set for sig' net weekly declines. 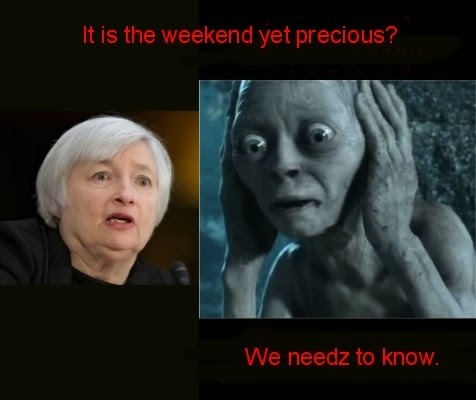 ..awaiting to see if the market snaps around 3.45pm.. when the Yellen is due. Could get a little wild in the closing 15 minutes... probably to the upside. *according to clown finance TV, there WILL be a press release at 3.45pm.. so there is a MAJOR threat into the close of a 'stupid spike'. ... get ya popcorn ready! Woahhhhhhhhh... what is going on there? 3.47pm.. Post Yellen press release.. no real spike in the main market.. but overall still inclined to the upside. 3.55pm. INTC in talks to buy Altera corp.
Price action is indeed very quiet.. as the weekend looms. The Yellen is due to make an appearance at 3.45pm... I am not aware if there will be a press release of any prepared remarks. In any case... rather than watching this tick for tick today.... I'm largely elsewhere. 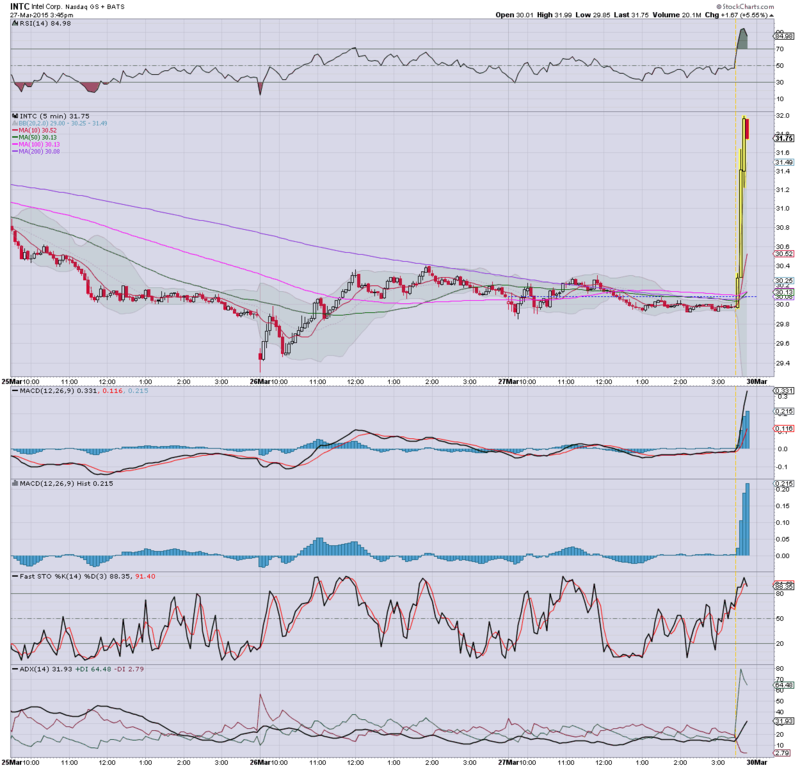 Notable weakness, copper miners, FCX/TCK, both lower by around -3%. US equities are moderately mixed, with the sp' stuck around 2062/58. Renewed upside into the weekend looks very viable... with price structure.. a micro bull flag.. offering 2075... along with VIX 14s. Gold remains a little weak, -$3, whilst Oil is -2.5%. Its getting a little tiresome again... as market is in minor chop mode.. but as noted... price structure is slanted in favour of the bulls. 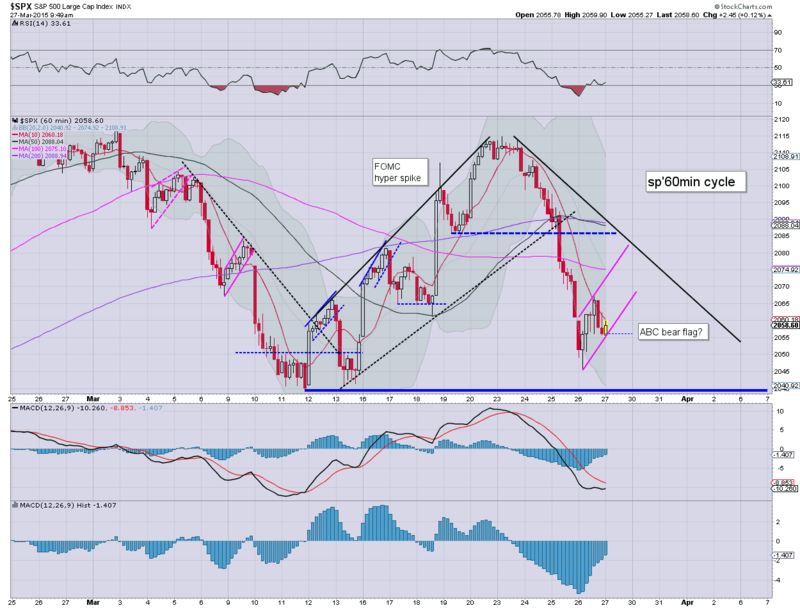 ... Yellen is due just before the weekly close... and that might be a valid excuse to settle in the 2070s. 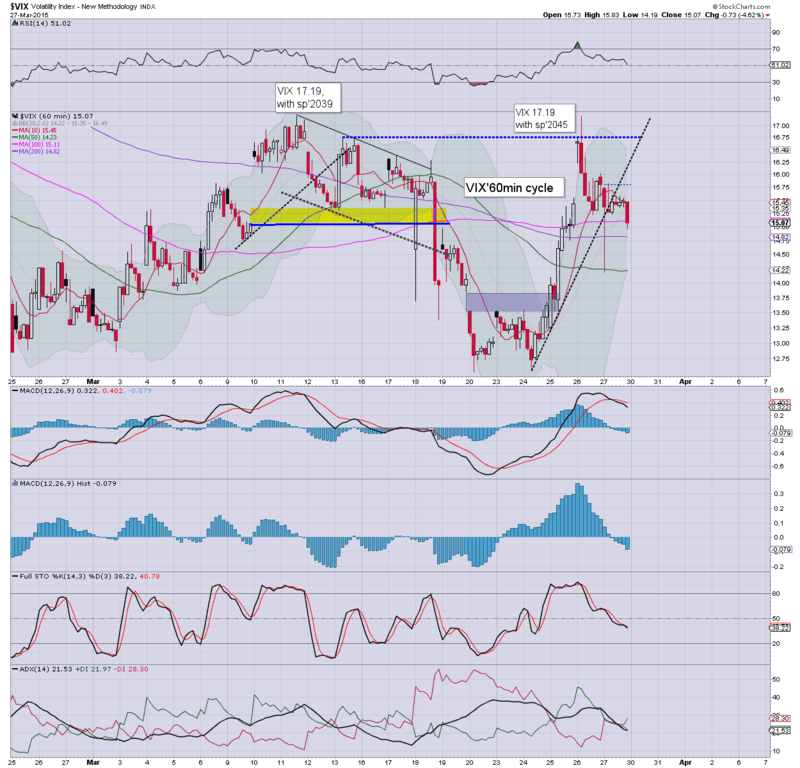 notable weakness: coal miners, BTU -8.1%.. with a new multi-year low of $5.03. 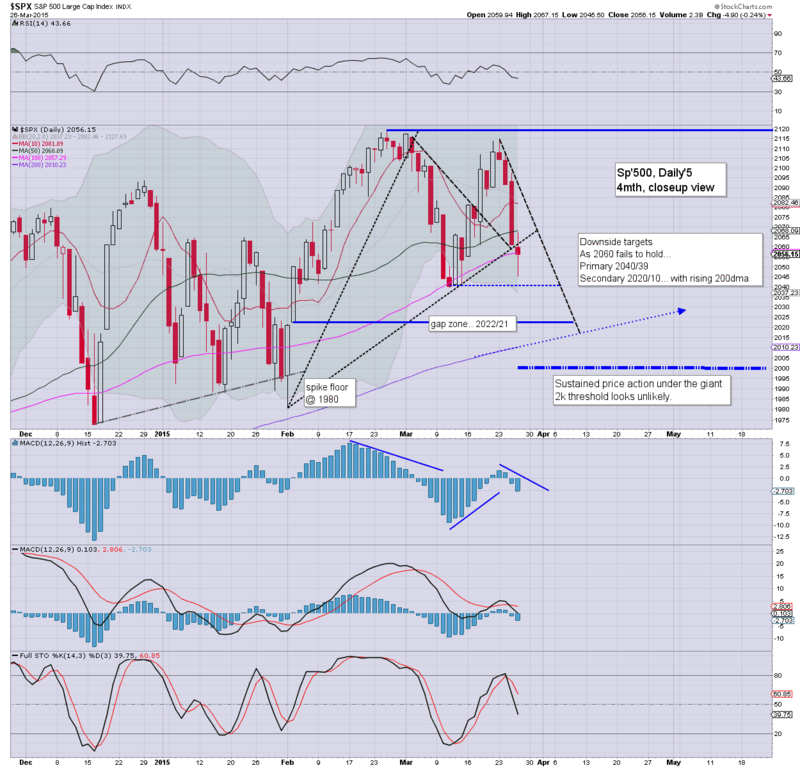 US equities are holding minor gains.. and look set for the sp'2070s before the close. Price structure is a rather clear baby bull flag on the smaller 15min cycle. Gold remains weak, -$4. 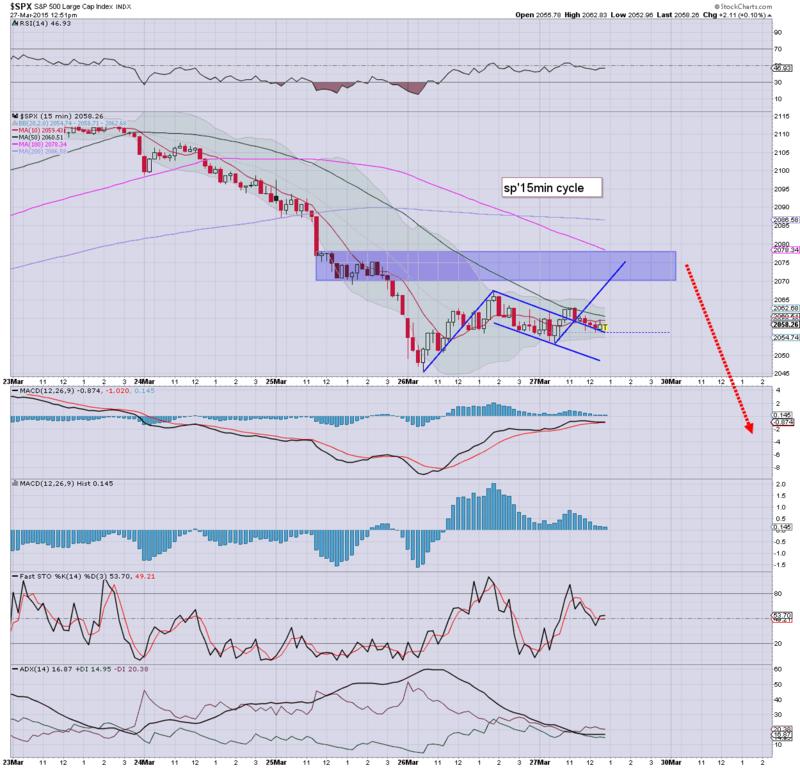 Oil remains significantly lower, -2.7%... hovering around the key $50 threshold. Market looks set to claw upward... and as a fair few are aware of... the Yellen is set to speak at 3.45pm at a west coast Fed conf. Whether the market will see some of the rats selling into the weekend... difficult to say. 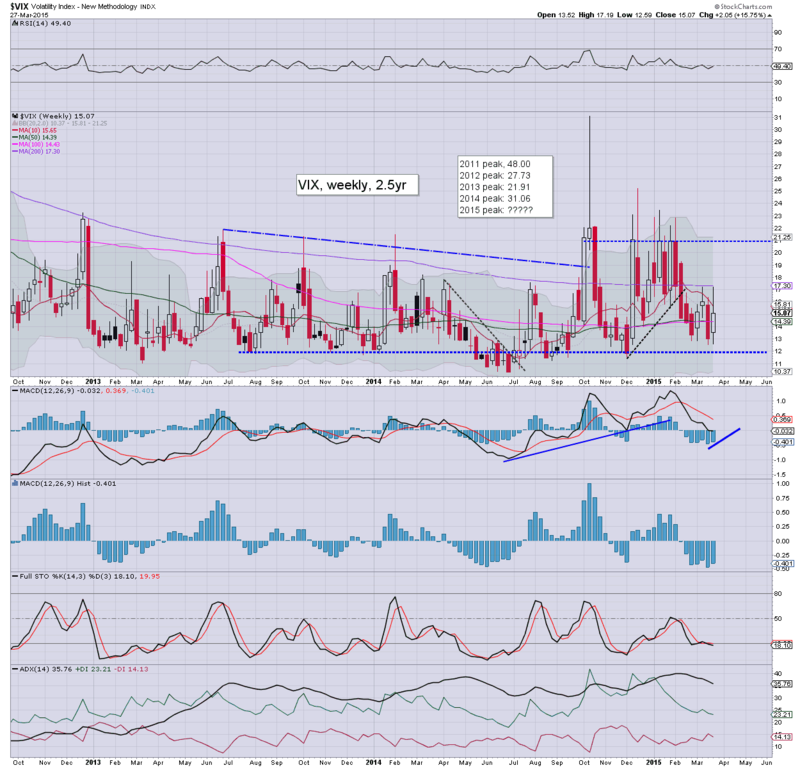 *that is a pretty sig' VIX call purchase... yesterday afternoon. 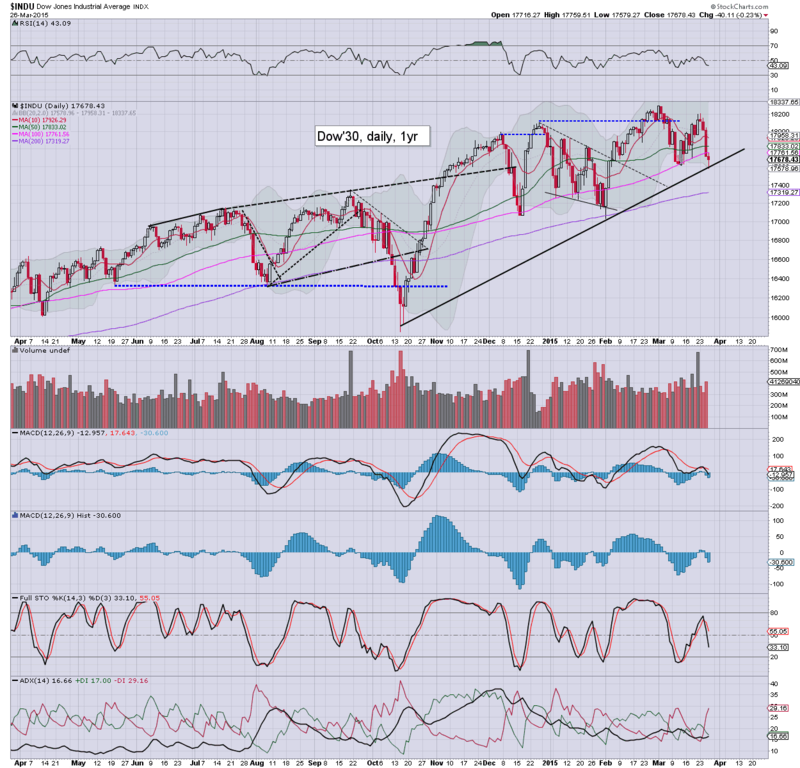 After a minor snap from sp'2061 to 2052, equities are resuming upward. 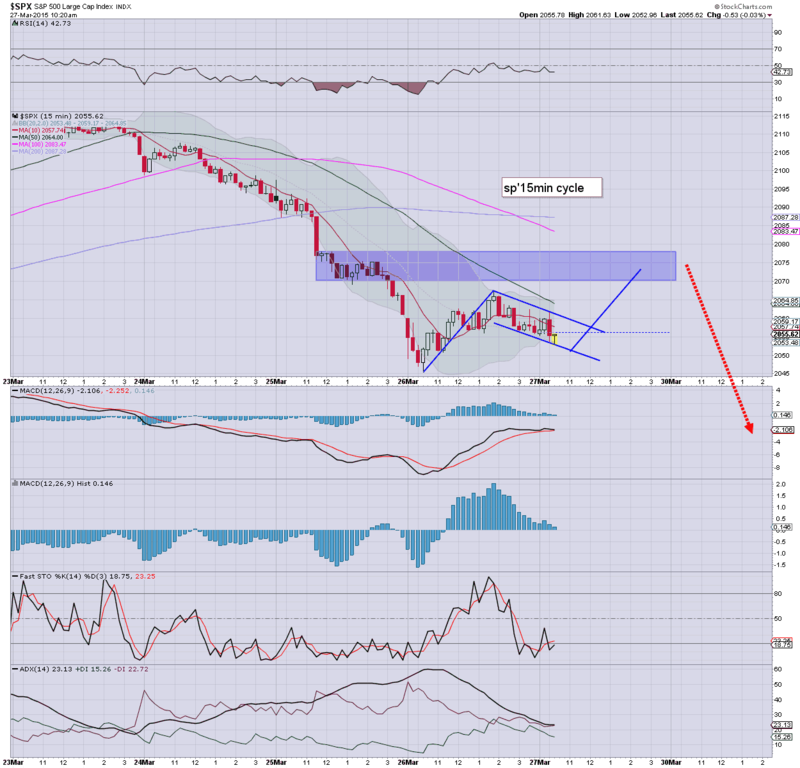 Price structure though is very likely a large bear flag.. which should max out somewhere in the 2070/80 zone.. late today. Metals remain weak, Gold -$3, with Oil -2.8%... losing over half of the Thursday 'war gains'. It looks like we'll claw upward into at least 2pm... which will no doubt annoy those bears still holding short from 2045 yesterday morning. 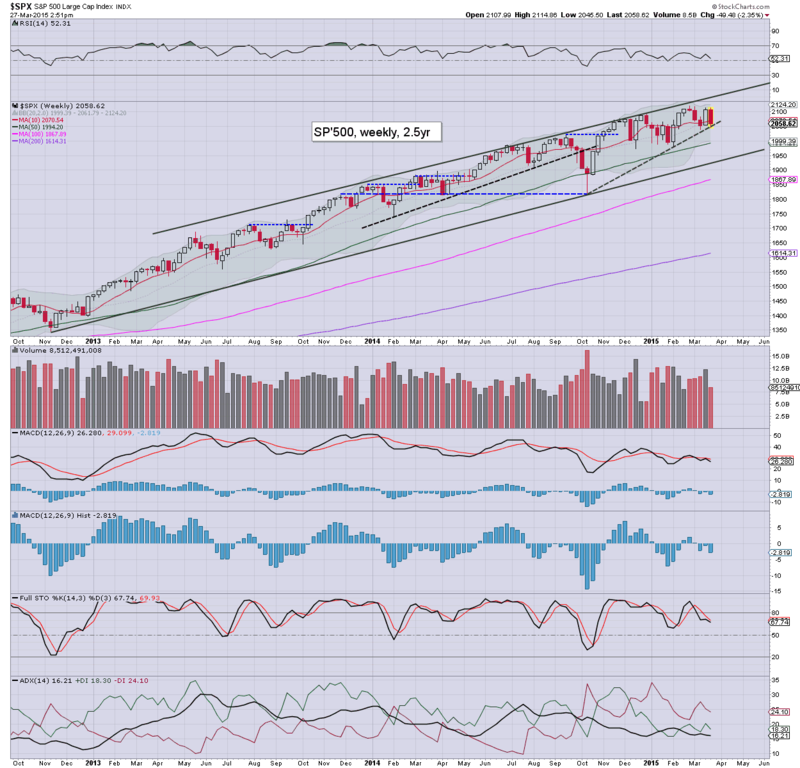 Best guess remains... renewed downside.. probably to the 200dma of sp'2010 by next Tue/Wed. Equities open slightly mixed, and it would appear the bears are powerless. 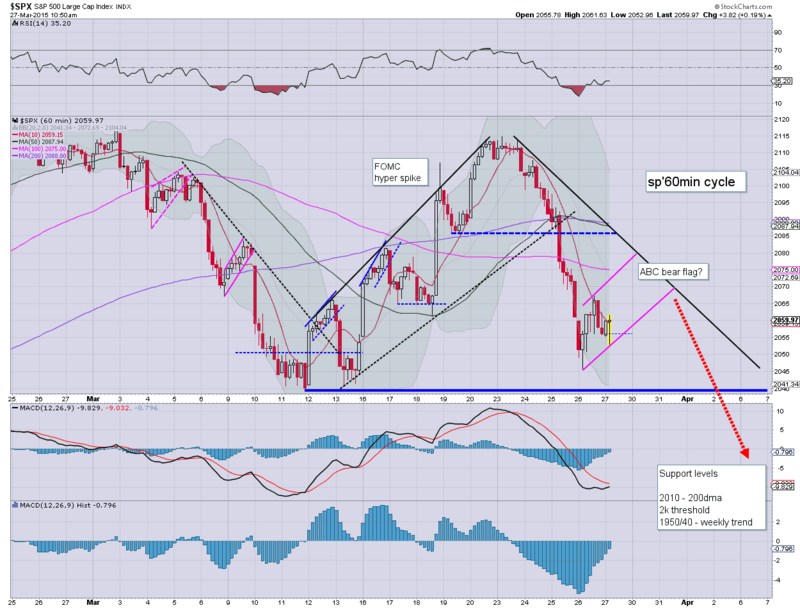 A break back over sp'2060 will open up 2075/80 by the close. Price structure is still a reasonable bear flag, and there remains threat of renewed downside under the key 2039 low.. but seemingly... not today. 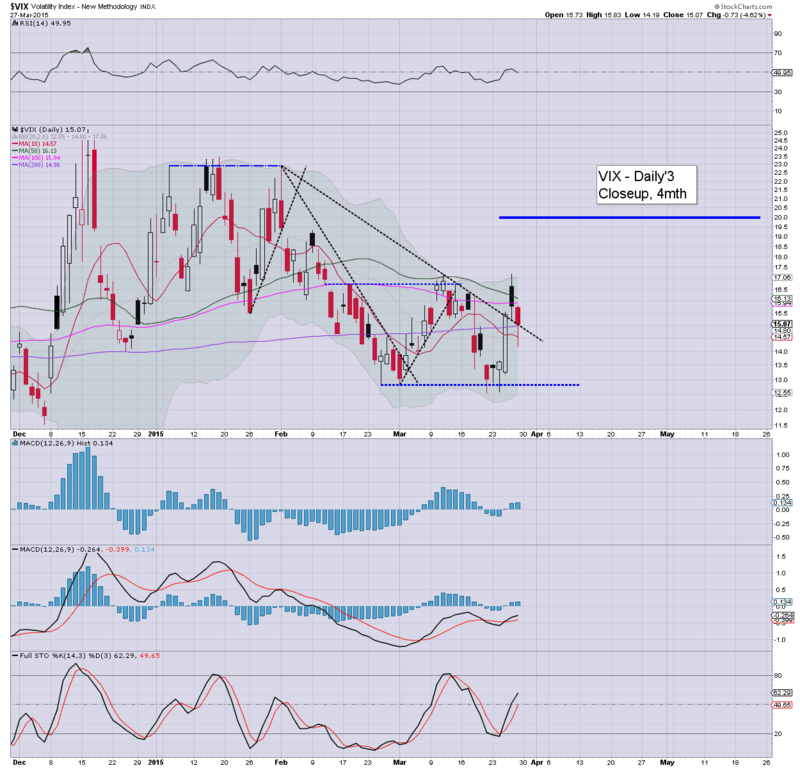 *VIX opens with one of those kooky downside spikes.. but much like we saw on March'18th (FOMC day)... and that sure didn't bode well for the equity bears by the late afternoon. So... its looking like we'll battle slowly higher into the afternoon. Clearly though, we'll still see a sig' net weekly decline across all indexes, which bodes somewhat bearish for early next week. 10.16am.. a minor snap from sp'2061 to 2053... but really... this still doesn't look great for the bears. Good morning. Futures are a touch lower, sp -1pt, we're set to open at 2055. Metals are a little lower, Gold -$2. Oil is cooling after the Thursday 'war gains', -1.2% at the $50 threshold. So.... can the equity bears make it five in a row? Another net daily decline looks far more likely than not. I see a few touting renewed strength, but really... how is that going to happen, not least since we saw a sig' bounce yesterday anyway from 2045 to 2067. Certainly, a break under 2040/39 looks due...and could certainly happen today. Once that occurs... next support is 2020/10... where the 200dma will be lurking next week. Whilst there was further renewed weakness in the equity market, there was strong upside for Oil prices. WTIC settled higher by $2.46 (5.0%) @ $51.43. 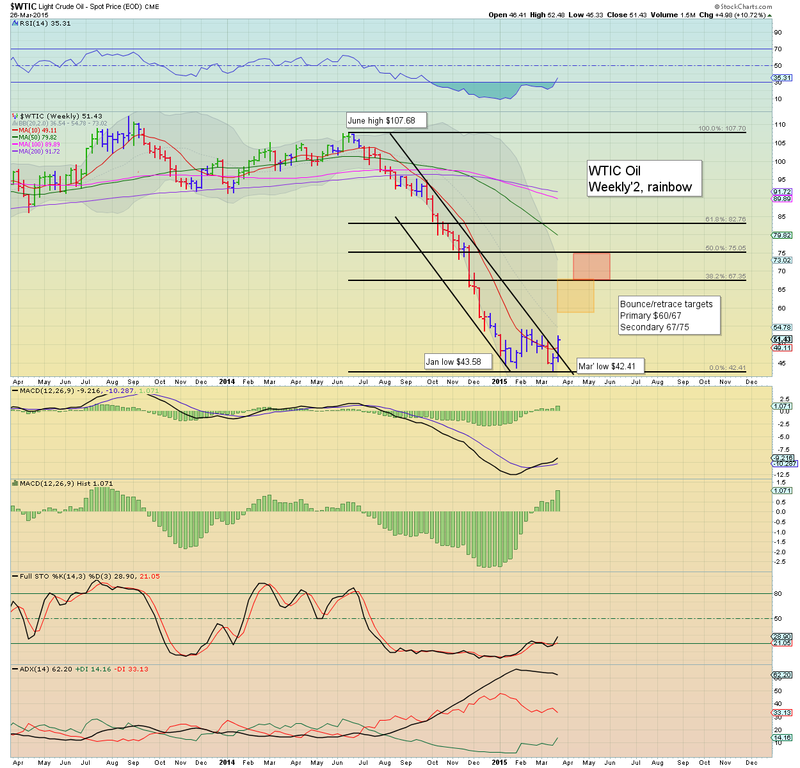 If $41.24 was a key short term low, then first retrace upside is the $60/67 zone. The underlying issue of over-supply though.. remains entirely unaddressed. The issue - at least to me, remains one of over-supply. Yes... short term 'war gains' could continue for weeks.. even a few months, but until the valves at individual oil wells are physically turned OFF... the inventories will continue to build. At some point this late spring/summer, storage will be maxed out.. and then it will be a fire sale. 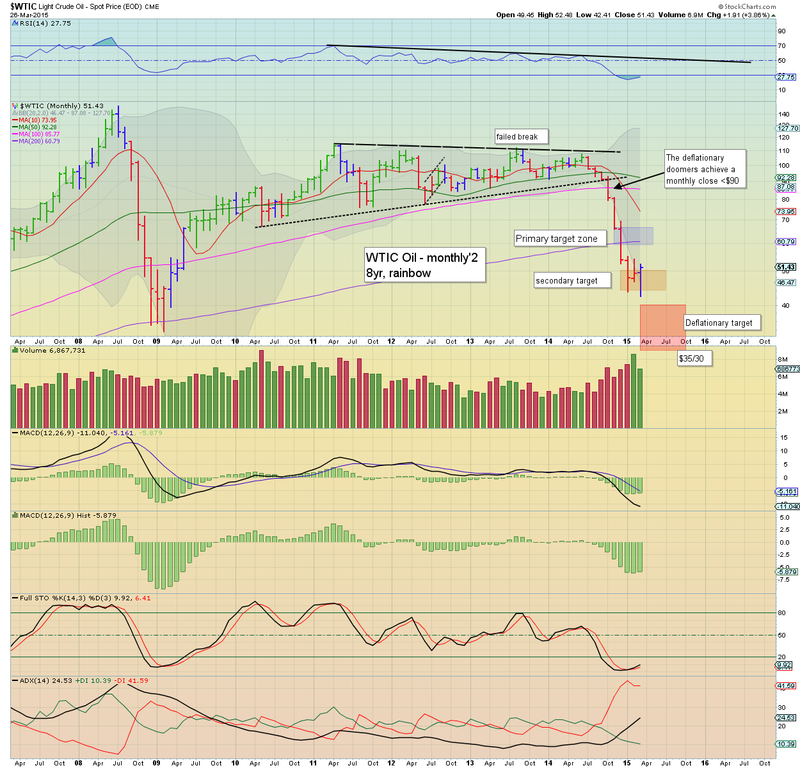 Right now I'd actually be looking to short oil... somewhere in the 60/75 zone, esp' once we're into June/July. 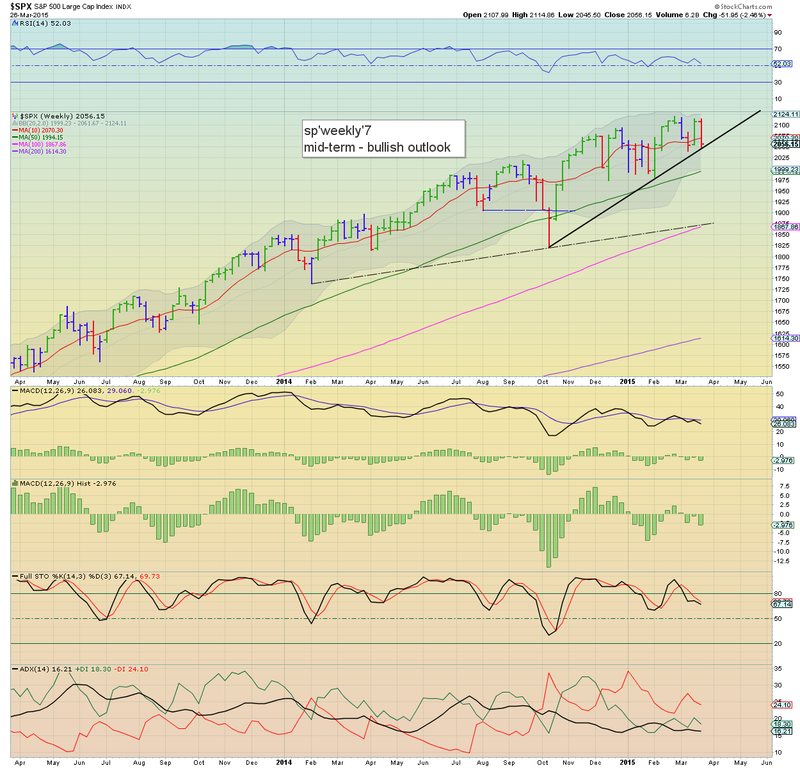 The sp'500 is close to breaking the rising trend from the Oct' low. If the March'11th low of 2039 low fails to hold - as I believe it will, then next key support is the 200dma around 2010. If that fails... then a test of the giant 2k threshold. Ultimate 'best case' for the doomer bears would be sp'1960/40 zone... but for now... that remains a mere hope. Friday with see the final revision for Q4 GDP, corp' profits, and consumer sentiment. 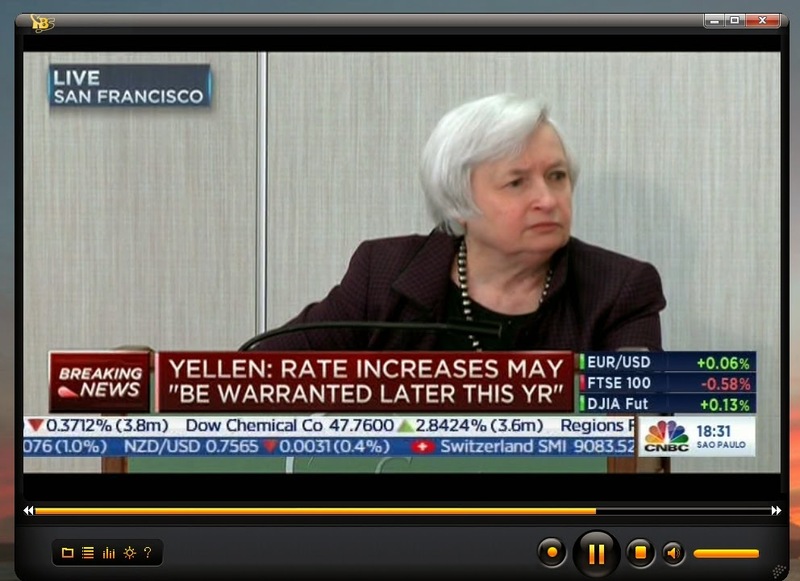 *it is notable that the Yellen will be speaking at 3.45pm tomorrow... at a San' fran' fed conference. ...everyone is different, but that means.. anyone can fit it in. I think she must be right, because although I don't look like anyone else, I really do feel at home. I will never be like other people, but thats alright.... because I'm a bear. A bear called... Paddington. US equities closed moderately weak, sp -4pts @ 2056 (intra low 2045), having seen a sig' bounce to 2067. The two leaders - Trans/R2K, settled -0.6% and -0.1% respectively. With technical breaks on the daily cycles, there looks to be further weakness into early next week... to the sp'2020/10 zone... where the 200dma will be lurking. *the R2K, Nasdaq have yet to break their rising trends from last October. 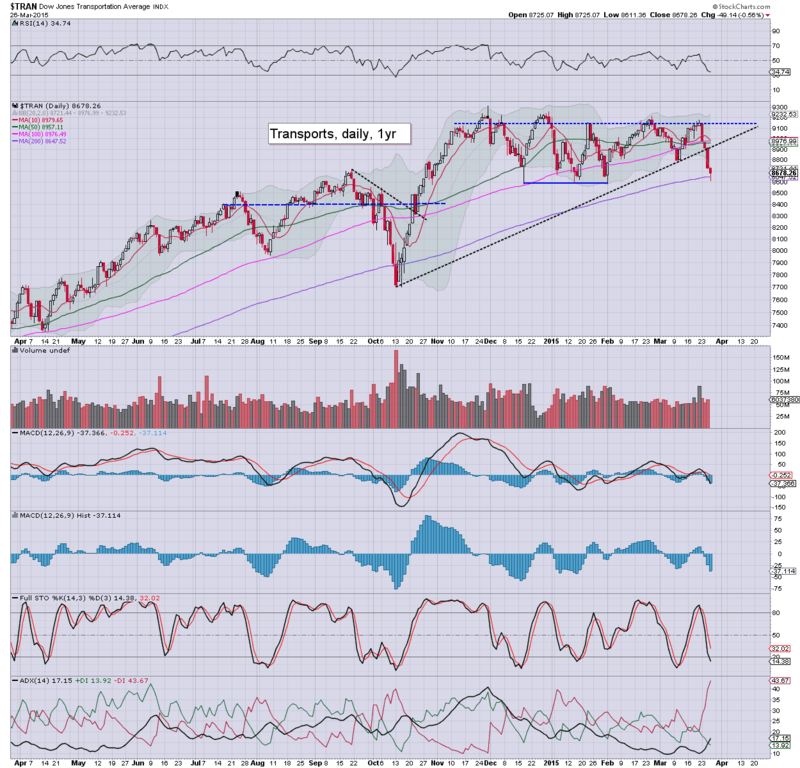 Suffice to say... some notable technical breaks today in the sp'500 and (arguably) Dow, following the Transports. Underlying MACD (blue bar histogram) cycle has now turned negative on all indexes, and typically, we can expect a few more days of 'broad weakness'... before the next up wave can begin.